Piano Teams: Ages 6-9. The perfect beginning piano class! Register for a lesson below. If you don’t see a class time listed, it means that class time is currently full. Please call 650-574-2844 for personal assistance from our Arts Administrators or to join our waitlist. Piano teams are fun, intimate piano classes of 2-4 children, where students have fun at the beginning of each class playing rhythm and note-reading games that reinforce music theory, hand coordination and piano skills. Even brand new beginners will be able to jump into the action on their first day! The class then transitions into private lesson time for each child with the teacher. Homework is checked weekly, and new songs are assigned at the pace the child feels comfortable and is able to succeed. These students are getting that important early-stage togetherness with a few classmates, while still getting lots of personal coaching in their personal private lesson. Our Team students love the balance of this format! Team Classes provide a small group setting (a cozy 2-4 children per class), while also providing personal weekly private lessons each. We’ve observed for over a decade at Myriad that Team Students tend to be more engaged and resilient in the early stages of learning their instruments’ challenges. 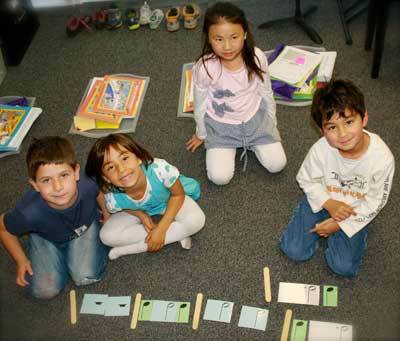 Teams are fun, unique piano classes where students learn correct technique and postures from the start, learn to read music, and have fun with our collaborative music theory & skill games. Individual home- play assignments are tailored to the child. Students progress at their own rate. Team lessons work well for students who are motivated by peer interaction. The teacher also works individually with each student on their own assignment so that each child can move at their own pace with their weekly songs. This small team-setting provides a balance. The collaborative critical-thinking aspect of this intimate class setting is less intimidating for younger students than being expected to produce results alone in the traditional private lesson setting. This is a powerful motivator. This means that our Team Students are excited about coming and sharing each week. Classmates celebrate each other’s successes and help each other through challenges. In this way, this setting also nurtures leadership in our young students. We’ve observed this phenomenum many times over the years. The longer lesson time gives students opportunities to practice the material with the teacher’s supervision. For the ensemble part of the class, students’ rhythm and listening skills improve more dramatically. Songs sound interesting and filled out. 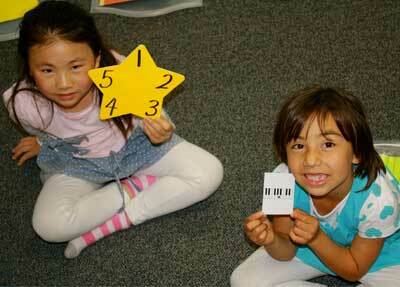 Opening exercises in note learning chants and rhythm clapping games. All team players help check each other’s workbook pages with a positive team attitude of helping the new beginners, and learning to look ahead at the slightly more advanced children’s work too. Everyone has a chance be an “assistant teacher” in this format. Private Session rotation during which the teacher coaches each child’s lesson book songs, and assigns new songs to take home. “Concerto Time” with soloists and “orchestra” back up. Each week, students take turns solos with their classmates accompanying. This is the part of the curriculum that really prepares young players for duets and performances, or our Rock Band curriculum later on. All students will receive a song book, theory workbook, take-home learning aids, ensemble songs, and a variety of activity sheets. This is the best choice for all Music for the Young Child graduates who have completed Level 2, 3 or 4 and wish to transition into piano classes. The BENEFITS of the class piano team experience are numerous and impart students with the basic knowledge essential for a positive, informed future with the piano. 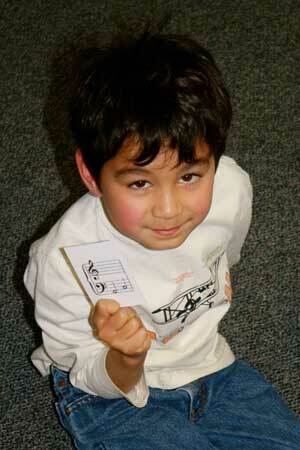 Children truly enjoy their piano lessons in this productive, enthusiastic and intimate setting. It’s all about making music together. All materials and books are age-appropriate and sequenced to be success-based. Students learn musical concepts faster in a piano class by experiencing both their own performances and those of their classmates. A piano class setting invariably fosters more relaxed performers. Music Theory, Ear-Training, and Sight Singing skills are more memorable, exciting and fun when shared with other children. Each week, students experience the piano as both a solo and ensemble instrument. Rhythm skills are enhanced through the incorporation of rhythm instrument accompaniments for soloists who desire an extra challenge. A piano class environment assists young musicians to master ensemble skills essential for band, chorus, or musical theatre in their future school programs.